Over many years the River Dodder, rich in history and archaeology, has been the engrossing subject of numerous books and papers. Most of what has been written focuses on particular aspects of the river, e.g. flora and fauna or foLklore and legend. In contrast, this book concentrates on the engineering history and topography while not neglecting other relevant issues of the river and the Bohernabreena Reservoirs. 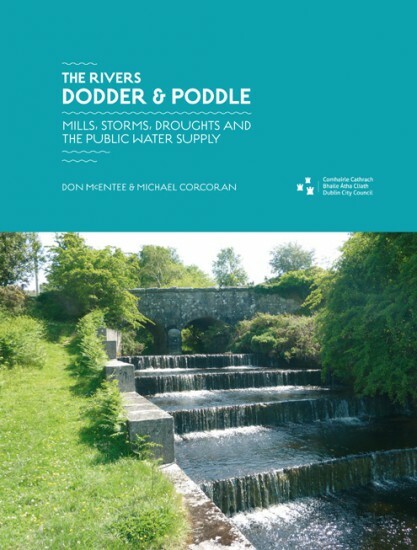 The Dodder's role in supplying water to Rathmines and Rathgarand the Later integration of this system with the wider Dublin public water network is also explained. Information has been collected from a wide range of very diverse sources - some of them contradictory - and only inserted on verification. The Bohernabreena Reservoirs, more properly known as the Glenasmole Reservoirs, and their unique role in water supply, millers' compensation rights and flood control, are a central feature of these pages. We have tried to describe the Dodder - as with any other river, having its own unique catchment and other attributes - from as many other different viewpoints as possible. Studying or writing about any subject in isolation from its place in the wider world usually results in an incomplete and unsatisfactory overview. The benefits of adopting a broader approach will be appreciated when looking at the Dodder's tributaries, among which the Poddle is certainly the most notable. This diminutive watercourse, through which the Dodder River supplied the City of DubLin with water by proxy from 1244 until 1778, merits much more than a passing reference and is therefore a prominent component of this narrative. The Dodder's long recorded history and the diversity of the roles it has filled - and including the havoc it has caused over the centuries - richly merits exploration within the various approaches adopted in this book. The compilers hope that the Dodder's many characteristics examined in the following pages will provide an acceptable record and stimulate others to undertake further research. Insofar as is possible, historical events are described chronologically, but it has sometimes been necessary to conclude a particular topic before going back in time to introduce another. Fords and bridges, mills and millraces, weirs, villages and other notable features (extinct or extant), with direct relevance to the river, are described. Although little is known of the remote history of the Dodder, some sadly incomplete records survive of mills that worked in the thirteenth century. Considerably more is known about the industrial development of the river and its tributaries that began in the Late seventeenth century. Until the late 1800s water, where available, was the preferred power source for most mills and factories. Apart from the mills, the only development near the river during this period was the erection of some cottages by employers for their workers. The only other happenings of note were the floods which occurred from time to time. Upstream from Ringsend, the only villages or hamlets of note were Ballsbridge, Donnybrook, Milltown, Rathfarnham, Templeogue and Tallaght, During the nineteenth century autonomous townships were established outside the Dublin City boundary, at that time defined mainly by the canals. On the southside, Rathmines & Rathgar and Pembroke, grew rapidly, approaching the Dodderfrom 1850s. Urbanisation eventually reached and Later embraced the river. West of Rathfarnham, the Dodder's surroundings remained stubbornly rural, with little or no development around Templeogue or Tallaght. It was hoped that the Dublin and Blessington Steam Tramway, opened in 1887, would encourage building, but when the line closed in 1932, nearly twenty years would elapse before this came to pass. Today, the Dodder, a much Loved amenity, flows through attractive Linear parks in built-up areas, kept pristine by volunteers who carry out regular cleansing sessions. Some confusion can arise from the different idiom and nomenclature used by people writing in long separated eras. In several instances, house names were changed or the premises referred to were demolished or replaced since the earlier articles or books were written. Place names have also been altered and two or more titles have sometimes been used simultaneously for the same area or district. To locate and understand fully the places described by people who wrote at different times, contemporary maps are extremely informative. It is also worth bearing in mind that perceptions and attitudes - official, communal and individual - have changed from time to time. So, what happened in any particular period should, as far as possible, be considered in the light of the mores and circumstances of that era.